The south façade of the Brissago house. The enclosed main courtyard, with closely matched wood and concrete. The kitchen looks south down the lake and west through the dining area. A bespoke oak table, bordered by Eames chairs, in the dining room. The main living room with sweeping lake views. Lake Maggiore bridges the mountainous terrain of northern Italy and the most southerly point of Switzerland. This vast serpentine body of water snakes all the way from Piedmont in the south to Locarno in the Swiss north. Unlike Lake Como and Lake Garda to the east, Maggiore doesn’t have the allure of money and celebrity, but its 65-kilometre length pairs alpine views with exotic vegetation. It also has an incredible wealth of striking architecture. Throughout the 20th century, architects have exploited the views, steep slopes, and mild climate, creating structures that redefined the relationship between the house and the landscape. 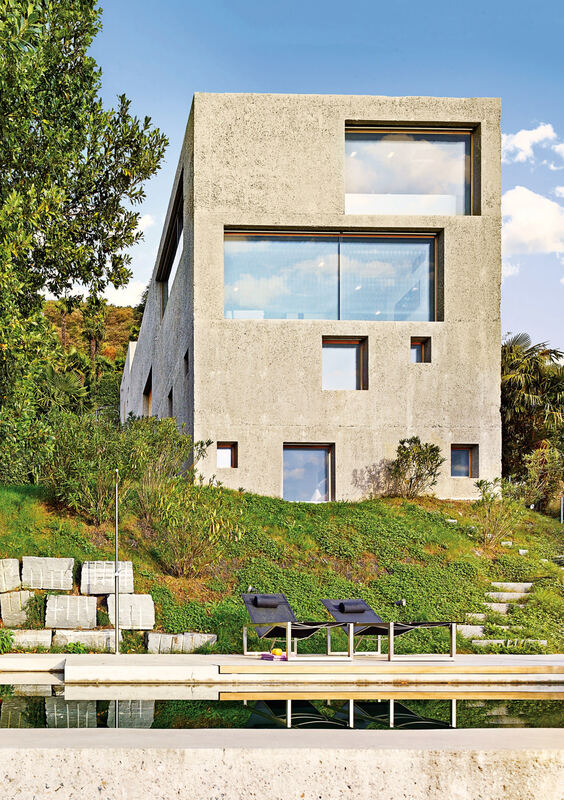 From the lofty heights of Richard Neutra’s masterpiece, the House Bucerius, to contemporary works by Italian and Swiss architects, the lake’s snow-capped slopes offer up the ideal canvas for architecture that relates to the landscape. 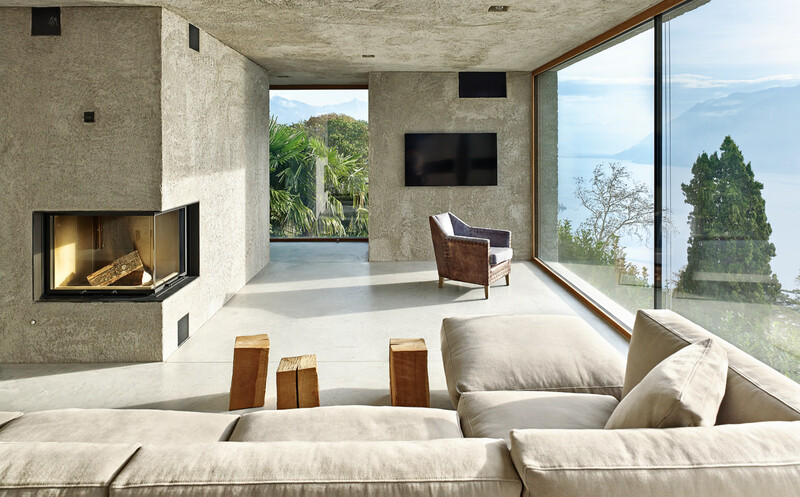 Wespi de Meuron Romeo’s concrete house is a modernist monolith in Brissago, Switzerland. The clients acquired the site because they loved the region, and the architects’ past portfolio was instrumental in winning them the job. Finished in concrete, the house is a pared-back structure that reduces its visual language to a sparse arrangement of blank walls and large windows, yielding nothing of the internal configuration behind the façade. Many layers of function are hidden behind the inscrutable walls and the architects have created a progression down through the topography of the site. The design not only sets up spectacular views over the lake, but also interacts with the landscape on every level, providing a variety of paths from the roadside down the hill, over, under, and through. 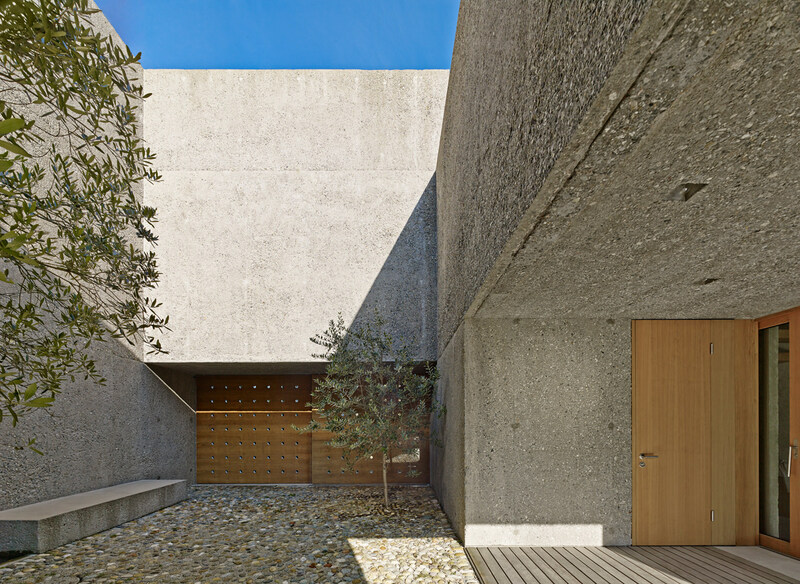 Rigorously defined in a roughly finished concrete, the Brissago house is arranged over four levels interspersed with internal courtyards, full-height windows, and carefully placed slots in the façade. At the top, a parking area is clearly defined just off the main road, setting up the architectural grid and material palette: stone, metal, and poured concrete, with windows and details set into the surface. Yet it also conceals more than it reveals, for the 2,000-square-foot residence is almost entirely out of sight below. From this modest space one descends down into an entrance courtyard, which opens up into the kitchen and dining area. There’s an intimacy and simplicity to this outdoor room, where a small table is set up in the entrance courtyard for private al fresco dining, with a sliding door at one end to open up the view to the east. Inside, the function is also arranged around the view; the kitchen counter with sink and hob appears to float before a frameless vista right down the length of the lake, while a long custom-made oak dining table is also set against a backdrop of glass to reveal the hills running down to the water’s edge. The slender wood and metal legs of the white Eames Molded Plastic side chairs cast long evening shadows on the polished concrete floor. From the fourth level a staircase and lift lead down into the main living area. Once again, the space is dominated by southerly views down the length of the lake, with the large floor-to-ceiling windows running the full width of the façade. The house’s interlocking, puzzle-like section is exploited to create two distinct outdoor spaces: a covered courtyard with a large sliding wooden door to provide access to the garden, and a main courtyard. This double-height walled space is planted with olive trees and tiled with cobblestones. Jérôme de Meuron describes it as the heart of the house. It’s where different paths join together, like in a historic village. 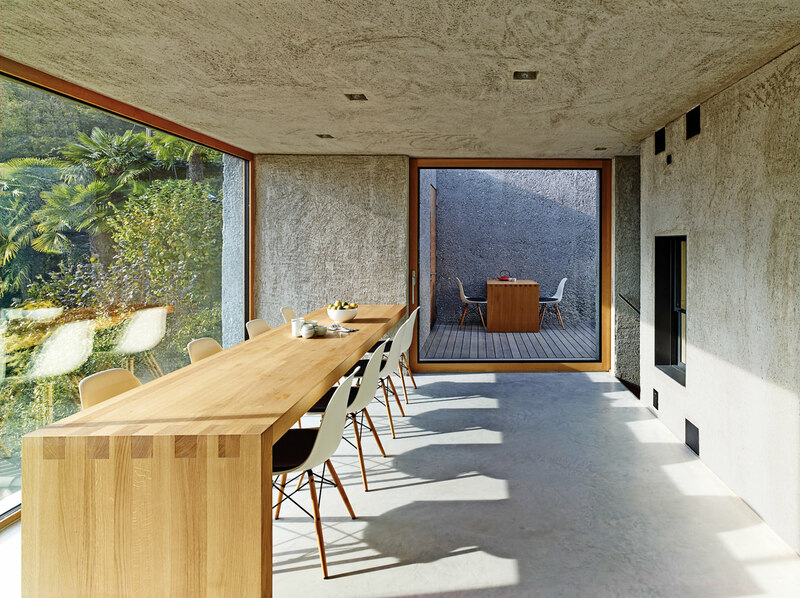 A concrete bench and water feature are joined by a second sliding wooden door, creating a route through the house and emphasizing the feel of a collection of related structures. 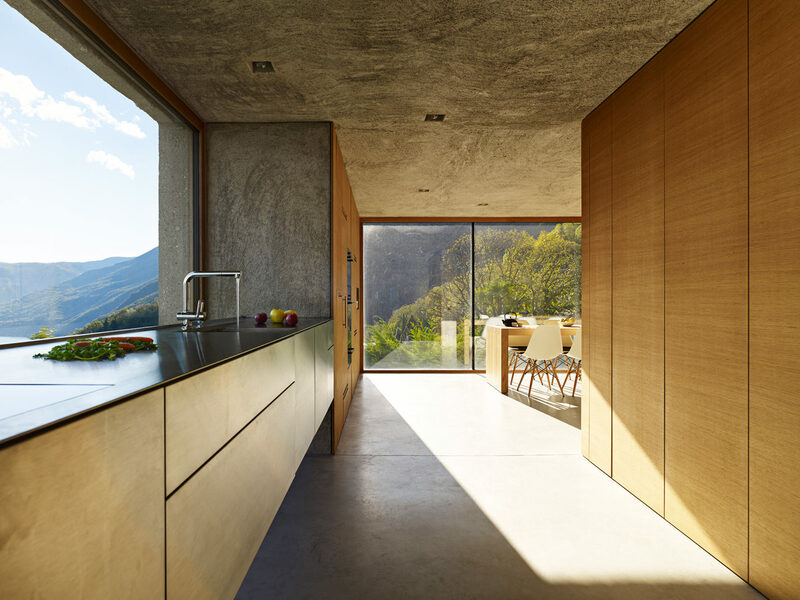 The Brissago house is a pared-back structure that reduces its visual language to a sparse arrangement of blank walls and large windows. The landscape is still very evident in the living room. Like the kitchen above, this generous room is a dual aspect space, with views across and down the lake. Arranged around the hearth, a large Flexform Soft Dream sofa wraps around the glass-fronted, corner-mounted hearth. Behind it, the concrete has been cast to form large shelving slots for books, ornaments, and artworks. The floor below contains two bedrooms, a bathroom, and a fitness suite, while the master bedroom is located on the first floor, alongside its own bathroom and sauna. Exits on both levels intersect with the sloping garden and provide additional ways of getting down to the pool. Wespi de Meuron Romeo were responsible for the design of all the built-in and architectural furniture, from the dining table to the beds and study desk, using solid oak. Sanitary ware and kitchen fittings are by the Swiss firms Arwa and Franke. The house itself was built by Verzeroli Elia e Figli, with the carpentry and joinery carried out by Steiner Schreinerei. The Brissago House builds on Switzerland’s admirable tradition of refined contemporary living, mixing a respect for landscape and site with a rigorous approach to materials and detailing. The result is warm but uncompromising, a place for contemplating the relationship between architecture and the natural world.